WOW!! What an incredible day!! Thank you to everyone for your support throughout this project. We couldn't have done it without the help of our school community, friends, families, corporate sponsors, Durham District School Board and, of course, Let Them Be Kids!! 8:00 - Registration Desk Opens - all volunteers must register and sign the waiver. Volunteers will be directed to the area in which they are assisting with. Playground Construction begins! 9:00 - Children's activities area opens at the YMCA field next to the school. Parents must accompany children and sign them in. 10:30 - Gardening activities begin in front of the school. 11:00 - Lunch will be served in the school cafeteria. Please note the children's area will close during lunch. 2:00 - Work activities completed. Opening Ceremonies begin. Thank you to everyone who has signed up to be a volunteer on Build Day! We have posted a list of activities for you to choose from to participate in on Build Day. You can access the list by clicking the blue Join the Effort button located right above our fundraising thermometer. Please complete the form indicating which activities you would prefer and the time frame in which you are available by Monday June 4th. It’s going to be a fun filled day with lots to do and we are excited to have you on board and supporting our project. On Build Day, all volunteers must check in at the Registration desk and hand in a completed waiver. 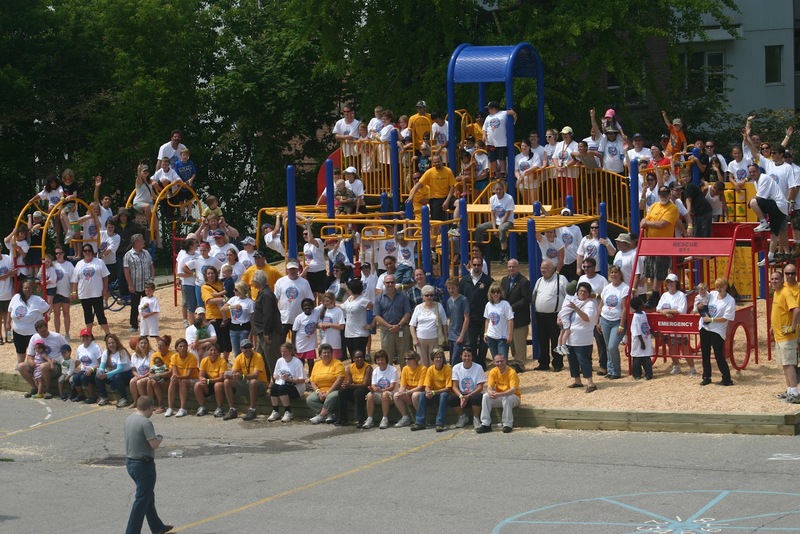 Our goal is to build the playgrounds in a manner that ensures all participants are safe. If you have questions, please ask your team leader or a committee member. To ensure your safety please ensure you dress appropriately for your task. It is requested that all participants wear closed shoes (no sandals or flip flops), dress appropriately for the weather, use sunscreen and take advantage of the water and snacks provided . We will have a first aid station on site. Lunch will be provided to all volunteers, although please note, that we cannot ensure that all products are peanut free. Waiver forms and instructions will be emailed out on Thursday, June 7th. Please read the instructions carefully and bring your unsigned waiver with you on Build Day to the pre-registration desk. All volunteers must complete the waiver. Please note that volunteers must be 16 years of age to participate in the building of the play structures. For other tasks such as the children’s activities and gardening , volunteers can be under the age of 16. We are in need of the following tools to assist with the playground build: wheelbarrows, impact drivers, cordless drills and bits, torx bits, rakes, wrenches/ratchets, outdoor brooms, tape measures, step ladders and outdoor 25 foot extension cords. Please indicate on the registration form what tools you can loan to the build and we will contact you what to bring by June 7th. Please make sure all tools are labeled clearly and we will also have materials available on June 9th to label your tools. Wheelbarrows are needed for site preparation on Thursday and Friday as well – if you have one and are able please drop it off on Wednesday at Village Union, they will be stored in a secure location when not in use. If dropping off heavy tools Saturday morning, please do so in the school parking lot and then proceed to the available parking area. Parking at Village Union PS will be limited. In anticipation of a great turnout, additional parking has been arranged at Oshawa Central High School , which is a 5 to 10 minute walk from Village Union. Central is located at 155 Gibb Street, just west of Centre and Gibb St. There is also parking at Rotary Park and the Glazier Medical Clinic across the street from Village Union. Please do not park in the bus loop off of Simcoe St as there will be volunteers working in the gardens. If you will be bringing your children with you on Build Day, please indicate so on the volunteer form. There will be an area set up for children at the YMCA next door to our school. Please note that there will be supervision from 10 am to 2 pm. Parents must accompany their child/children to the supervised activity site and sign them in and out. Please note that parents must remain on the build site. We are pleased to announce that we have reached our fundraising goal of $50 000 to build two play structures in the yard!! All donations will be matched by Let Them Be Kids who have supported our project through their Helping Hands Award. We would like to thank all those who have supported us through financial donations, materials, their time on Build Day and food for the Build Day! 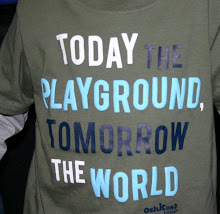 Donations continue to be accepted to ensure ongoing maintenance of the playground and further enhancements to our school yard including the construction of a sandbox for our Kindergarten yard. Thank you to everyone who supported our Community Day last night! Families had lots of fun playing games, doing raffles and enjoying the barbeque. 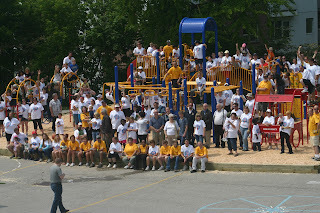 In addition, Stuart Smith presented our school with $7500 cheque for the playground. This brings our total to almost $40 000!! We're getting close!! Our second bottle drive is Tuesday after school. Please bring your empty, returnable bottles to our parking lot between 3:10 and 4:15. After a very successful bottle drive in April, we are having another one on May 22. Community members are invited to drop off any returnable bottles between 3:10 and 4:15 in the school's parking lot. Let's try to raise $400 this time! Two comedy shows have been organized for community fundraisers. The first, featuring local talent, will be held May 4 beginning at 8:00 p.m. Tickets are $10 at the door. The second show, May 12, includes dinner and a comedy show featuring Yuk Yuk's Ian Sirota. Dinner begins at 6:00 p.m., the comedy show at 7:30 p.m. Tickets are $40. Both shows are being held at Stuttering John's on Simcoe Street. Please come out and support our playground! Village Union PS is situated in Oshawa, Ontario. We have almost 400 students, which includes students from JK to grade 8 and various special education classes. We also host the Deaf and Hard of Hearing program for Durham District School Board.